Friday night: Quick evening shower, then clearing. Comfy. Near 60. Saturday: Partly sunny & warm. 80. Sunday: Mostly sunny. Cooler. Low/mid 70s. A decaying cold front over New England may generate a few clouds today, otherwise it's the brightest day we've had this week with a high temperature close to 80 degrees. Wind from the west will be at 10 to 20 mph. This weak front stalls along the South Coast, with low pressure coming along the front tomorrow with clouds returning to southern New England. Rain will be close, perhaps getting wet from New York City to the islands south of New England. The farther we go north, the brighter the sky, except in northern Maine, where a different front may generate a shower. 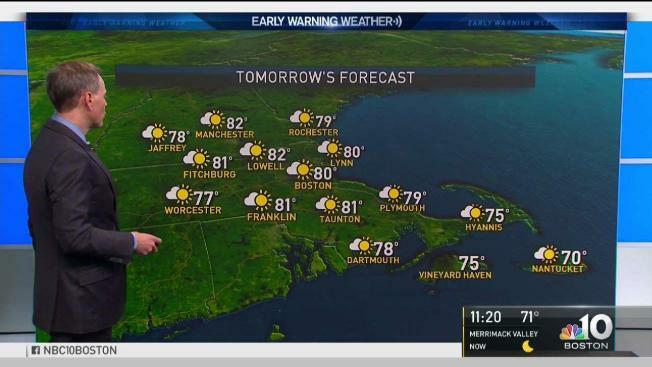 High temperatures tomorrow in the 70s - a nice summer day. Weak low-pressure southeast of Nantucket will pull away with fresh air from Canada moving in for a nice Sunday too, with plenty of sunshine and a high temperature in the 60s and lower 70s. There's not much change in the pattern next week; a series of fronts from Canada could bring an occasional shower, but the air in Canada has been warming up, so most of New England will be seasonable, with s high temperature in the 70s.